It is now well known that the constellations of the Zodiac originated in the ancient land of Babylonia (modern day Iraq). Yet, despite more than a century and a half of scholarship, very little information on this subject has been made accessible to the non-specialist. 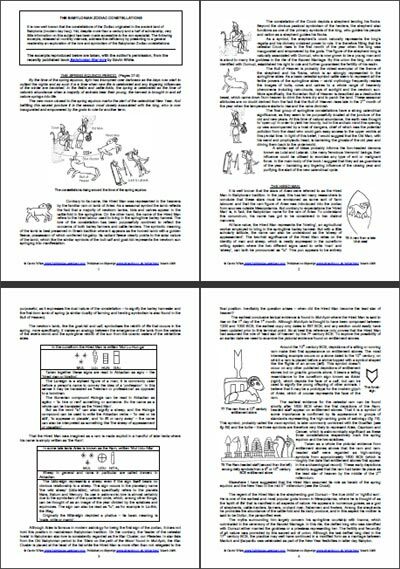 We are very grateful to Gavin White for allowing us to reproduce excerpts of his recently published Babylonian Star-lore. Over the forthcoming months these articles will help to address this deficiency by presenting the lore and symbolism of the twelve Babylonian Zodiac constellations. 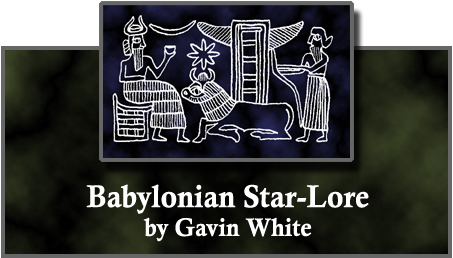 The excerpts reproduced on this site are taken, with the author's permission, from the recently published book 'Babylonian Star-lore' by Gavin White. The article made available for download is copyrighted to Gavin White and is offered here, with his permission, for private and non-commercial use. It may not be reproduced further without his specific agreement. To contact Gavin directly, go to his website at www.solaria-publications.com. Published online March 2009.